It’s important to feel safe and secure when it comes to an exterior/entry door. I don’t think anyone would feel comfortable installing a regular door knob with no type of lock on an exterior door, I guess unless you live out in the middle of nowhere and I am guessing that probably means you leave your keys in your car too. Anyway, not everyone lives where there are no neighbors in sight. So it’s important to find a lock(s) that makes you feel comfortable when leaving the house for the day or maybe days. Believe it or not there are a lot of door lock options for an entry/exterior door, not just your basic door knob that has a key. The most common combination is probably a basic single cylinder deadbolt with a passage function knob or lever. A passage function means it has not type of lock on the door knob or lever, the deadbolt is how you would keep your door locked. You could choose a double cylinder deadbolt if you wanted, but that mean’s it will be keyed on the outside as well as the inside. It’s not recommended for most doors, as it could be a fire hazard. Another good choice would be to find a deadbolt that you like and pair it with a keyed door knob or keyed lever. Sideplate locks are a little fancier option with so many different plate options and you get to pair it with your choice of door knob or lever and choose whatever of the many finishes. These work basically like the first option (deadbolt and passage function knob or lever) except it has a fancy plate in between. Sideplates are from Emtek. The picture above shoes a sideplate with a CC of 3 5/8″ (which is not standard prep). 5 1/2″ CC sideplates are available on the right hand side of this page. And last but not least, you can also find many many styles of Handlesets. These are pretty popular as well for a front door, maybe not so much for a back door or side door, but the front door it’ll sure make a statement. 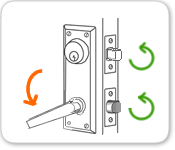 Most handlesets will only have the above deadbolt to keep the door locked, but if you are wanting added security and have 2 locks you can check out the two point handleset locks. Don’t forget to check out the keyless locks, which could take place of several of these options. Schlage residential door hardware is a super popular brand. You can find this brand almost anywhere, even your local Home Depot or Lowes should carry the Schlage residential door hardware – although they wont have as many options as far as design and finish go, but they will have a few basic designs to choose from if you aren’t too picky. Schlage is a great brand to have in your home or maybe even your office. Schlage residential knobs and levers (most of them anyway) have an ANSI rating of a Grade 2. For those of you who need or want more information on ANSI rating, read on – I will go into more detail for you. ANSI may not mean much to most people shopping hardware for their home, but it can be pretty important for the people looking for hardware on a commercial application. ANSI stands for American National Standards Institute. ANSI is an agency that tests and sets standards for lots of different things. BHMA, or Builders Hardware Manufacturers is a similar agency. The difference is that BHMA only tests and sets standards for door hardware alone, whereas ANSI can test on almost anything. When I say tests and sets standards, this just means basically they give each door hardware item (or any item if we are talking ANSI) a grade such as grade 1, grade 2 or grade 3. I’m sure you have probably heard of that before. Grade 1 is the highest grade. This is the grade that those commercial application people are looking for. The hardware with a grade 1 is used on public buildings like hospitals and schools etc. So basically the Grade 1 is for most of the commercial hardware that you will find. Grade 2 is more of a light commercial grade. You can find this type of hardware used on apartment buildings, or office building, like a dentist office for example. So like I said, most of the Schlage residential hardware is a Grade 2. Grade 3 is the simple hardware you will find in a home. Most homes wont need a grade 1 or 2 for a home because the doors are not used quite as often so it’s not necessary. If you are familiar with some of the brands we carry, Kwikset residential is a grade 3. Sure-Loc would probably fall into this grade, if it were graded. Do you have the Superior brand multi point or patio doors? Are you looking for some options to replace the hardware? Emtek offers tons of options of exterior and interior trims, called Emtek Multi Point Lock Trim sets, that attach right to your existing mechanism. There are tons of back plates and tons of levers after you find what backplate suits your style. These are assembled the way you choose. With whatever back plate, with whatever lever, with whatever finish and function. If you go to the Emtek Multi Point Lock Trims page you will find several configurations, these are important to look over before you order, to make sure the correct trims will be sent to you and will fit your Superior doors (or any other brand of door). Configuration 1 is the one you should be looking at if you have Superior doors. If you don’t have Superior doors, find your brand of door listed under any of the 7 configurations. You will want to make sure your existing mechanism matches up to this configuration. If for some reason it doesn’t, the Emtek trim sets we send wont fit properly. It’s important to know that these are ONLY the trims, meaning they DO NOT include the interior locking mechanisms of the door – the mechanisms should be provided from your Superior door manufacturer. These will include a trim for the exterior side of the door and a trim for the interior side of the door. With all the options of backplates, levers, and finishes you should easily be able to find something that will fit the style you love for your Superior Doors. That’s what makes Emtek so great, because you don’t easily run out of options. Emtek’s hardware is made of solid brass as well, so it’s sturdy and functions smoothly. Be sure to call if you have questions or need help ordering!